Find out what you need to know to be in compliance with the City and County of San Francisco’s environmental ordinances, enforced by the San Francisco Department of the Environment. San Francisco residents and businesses are required to properly separate recyclables and compostables and keep them out of the landfill. San Francisco commercial property owners or managers are required to provide adequate refuse collection service to the tenants, employees, contractors, and customers of the properties. Existing commercial buildings with 10,000 square feet or larger of conditioned space are required to conduct an energy efficiency audit once every five years, complete an annual energy use benchmark, and share the results with tenants, the city, and the public. All construction and demolition (C&D) debris materials removed from construction and demolition projects are required to be properly recycled or reused. This ordinance affects all construction projects such as new construction, remodels, tenant improvements, repairs, deconstruction and full or partial demolitions. San Francisco multifamily property owners or managers are required to provide adequate refuse collection service to the tenants, employees, contractors, and customers of the properties. Mandatory Recycling and Composting Ordinance San Francisco businesses are required to properly separate recyclables and compostables and keep them out of the landfill. The plastic checkout bag ban applies to all retail stores and all food establishments, and requires a charge on allowed checkout bags (compostable bags, recycled paper bags, or reusable bags). Shoppers can avoid the charge by bringing their own bag. The Food Service Waste Reduction Ordinance requires food vendors and restaurants in San Francisco to use compostable or recyclable to-go containers. Businesses with 20 or more employees nationwide are required to offer commuter benefits to their San Francisco-based employees. Starting October 1, 2014, no person may sell or distribute bottled water at an event held indoors or outdoors on City property, including a city street where the event sponsor has access to on-site potable water connections adequate to meet the hydration needs of the event participants or attendees. 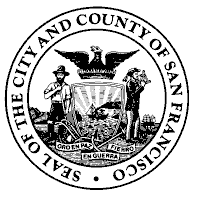 For a comprehensive list of all Ordinances, view the City and County of San Francisco’s Environment Code. Sepa todo lo que necesita saber para cumplir con las Ordenanzas del Medio Ambiente del Condado y Ciudad de San Francisco, aplicadas por el Departamento del Medio Ambiente de San Francisco. Asistencia con idiomas: Para información adicional de las ordenanzas en distintos idiomas, llame al (415) 355-3700 lunes a viernes 9am-5pm. Hanapin kung ano ang kailangan mong malaman upang sundin ang mga ordinansa sa kapaligiran ng City at County ng San Francisco. Wikang Tulong: Para sa karagdagang wikang kaalaman tungkol sa mga ordinansang ito, tumawag sa (415) 355-3700 Lunes-Biyernes Ika-9 n.u.- ika-5 n.h.